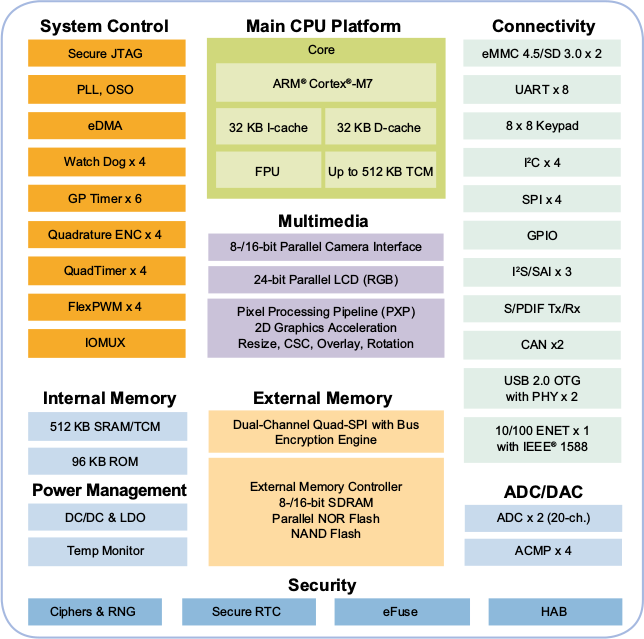 Microcontrollers (MCUs) provide real-time processing, low power, low cost, and plenty of I/Os, but with security and user interface requirements of recent embedded devices, the processing power may be a limitation, and embedded systems designers may have to use an application processor instead gaining performance, but losing some of the benefits of MCUs. The bridge the gap between performance and usability, NXP has launched i.MX RT series of Crossover Embedded Processor which uses the powerful ARM Cortex-M7 MCU core clocked at up to 600 MHz, a frequency partially made possible by eliminating on-chip flash memory. The company claims i.MX RT processor provide twice the performance & power efficiency, half the cost, and allows for faster development time. NXP also explains the BoM cost is reduced due to the high integration of the solution, and the embedded processor can be used in 4-layer PCB designs. Software development for the i.MX RT crossover processor can be done with MCU tools like MCUXpression, IAR and Keil, and it also supports FreeRTOS, and ARM mbed. There’s an evaluation kit, but no details were provided. NXP i.MX RT1050 processor is sampling now, with broad availability expected for October 2017, and pricing starting at less than $3.00 per unit for 10k orders. More information can be found on the product page. The difference is that the H7 has embedded flash. I give the NXP thumbs up for having a guts and supporting the QSPI with encryption. This means that I can add 16M of external flash for about 2$.. If that would be embedded in the MCU the it would cost 20$ or more. The demo board is available, besides, some IDHs and other suppliers also have related development board and SoM based on i.MX RT1050 series processor. Forlinx is one of the companies, their SoM makes FLAC 7.1 solution possible and even spectrum analyzer.